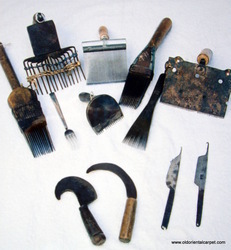 Materials, tools, skill and patience are vital for quality repair and restoration. 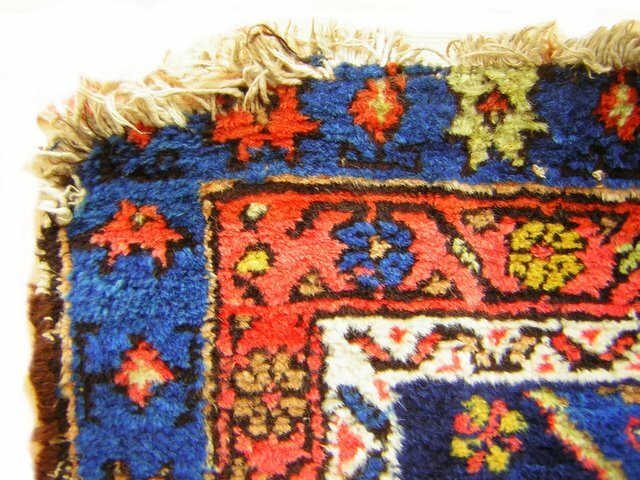 The restorer must be able to copy the style of the original weaver and use the Persian, Turkish, Nepalese, Berber and Spanish knots, as well as techniques used in flat weaves and kilims. 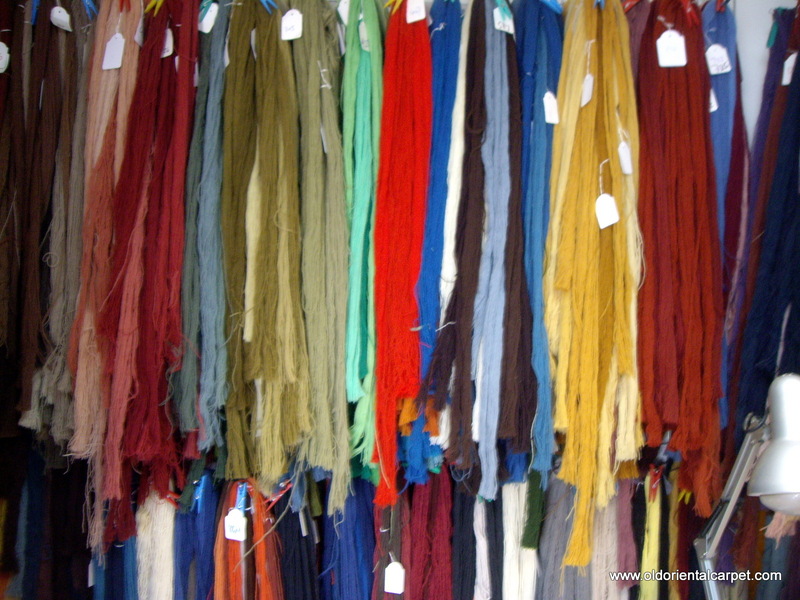 I have hundreds of shades of wool and from them can blend virtually any colour. In addition, I have goat, camel, yak and horse hair as well as dozens of cottons and twines, cowrie shells, beads and tassels. I only undertake justifiable work. 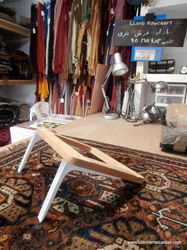 Here are some example of work I have done. I learned a lot from Suleiman Hajji about restoration during my visits to the North West Frontier. 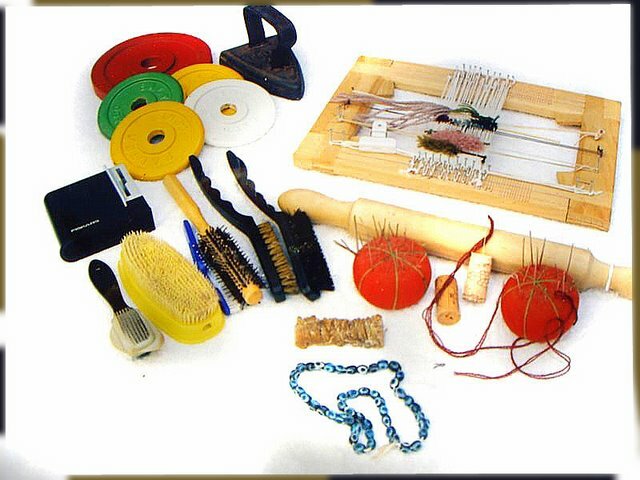 He works in Peshawer and many Afghan dealers use his skills. I always spend time with Mohammed Hammoud in Marrakech. He has a rooftop "studio" and is always generous with his knowledge. 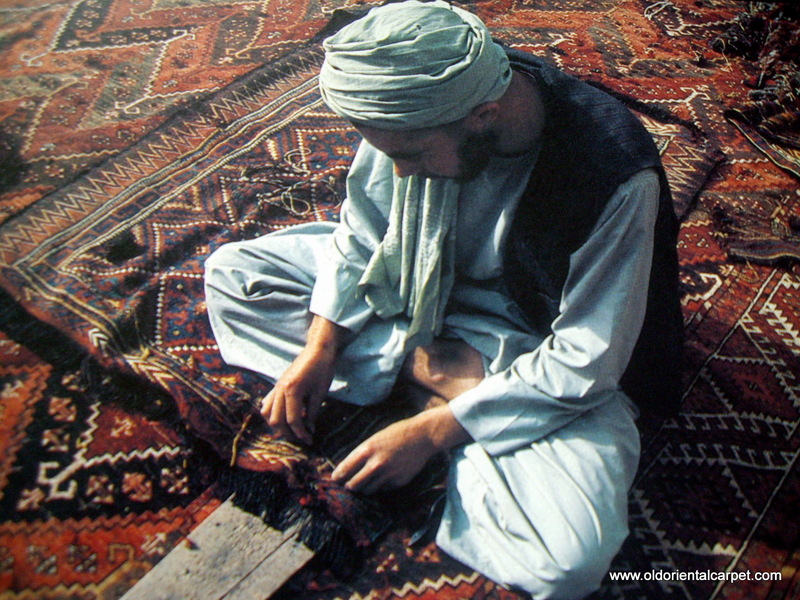 He taught me the various Berber knots. 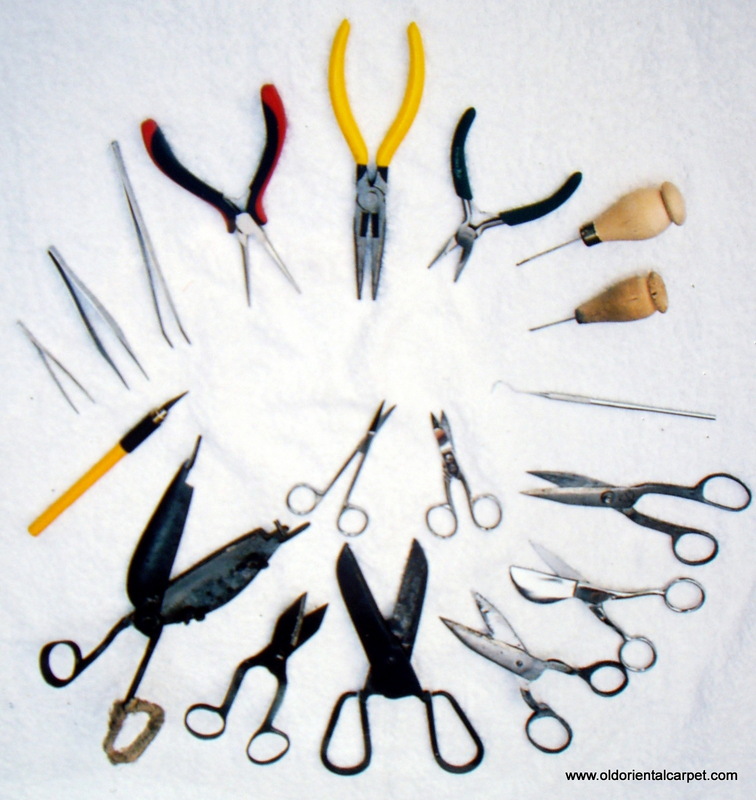 Scissors, tweezers, pliers, a dental probe, scalpel, and traditional Persian hooks are all in daily use. 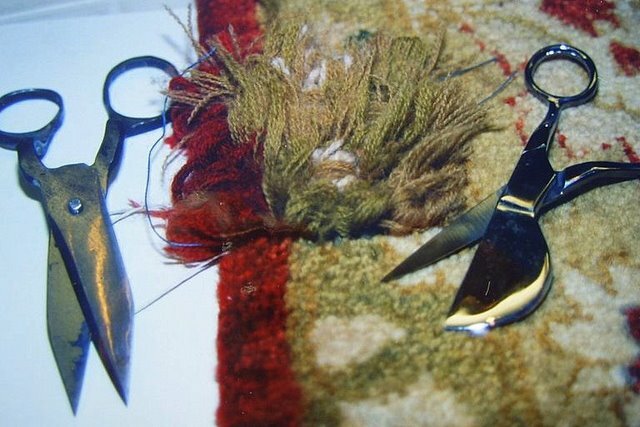 A selection of hooked blades from Persia and Afghanistan, together with beating combs from Turkey, Spain, Morocco and Persia. More brushes than your hairdresser, weights to keep the repair piece steady, a little practice loom, some beeswax, scissor sharpener, my grandmother's rolling pin, pin cushions and naturally a set of glass lucky beads. 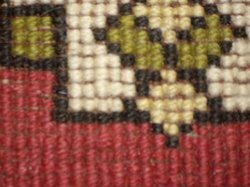 I keep a complete range of two and four ply wool and from these can blend virtually any shade. 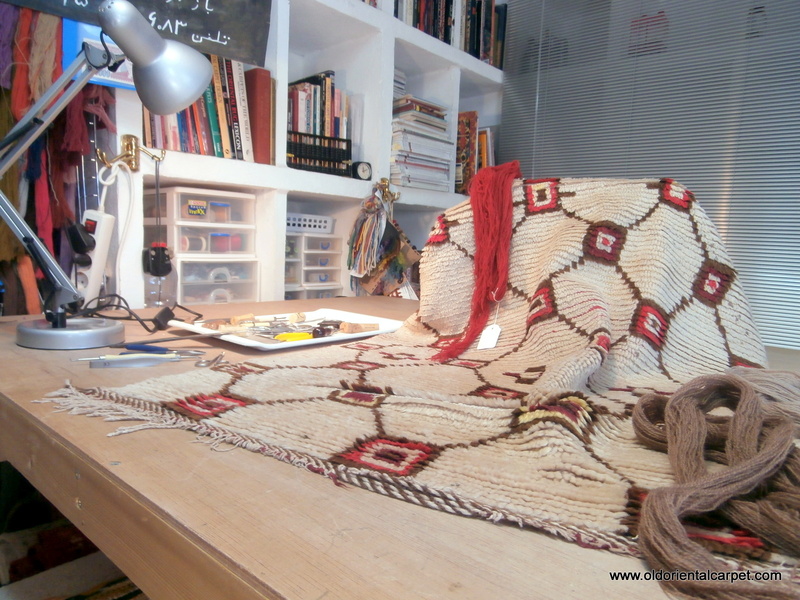 I also keep naturally dyed wool and materials from old kilims which can be re-used. 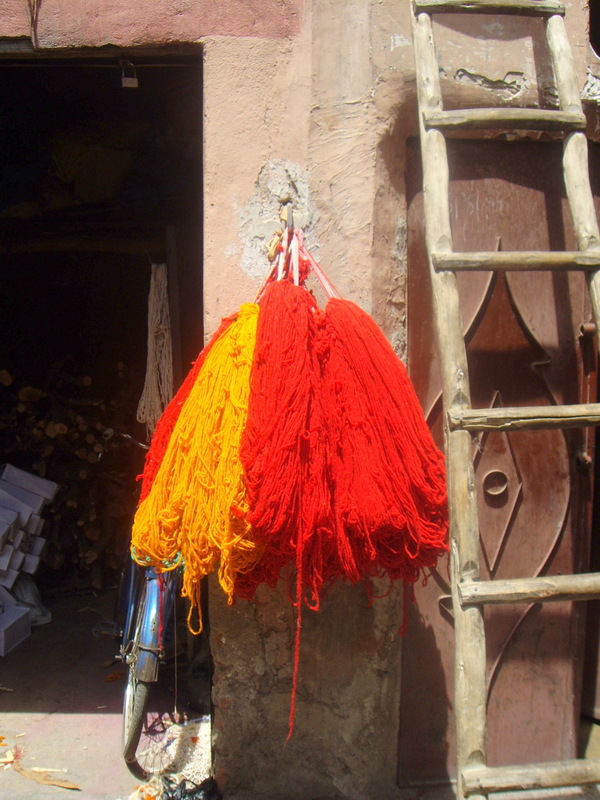 I also buy wool directly from Berbers in Morocco. Serious surgery. 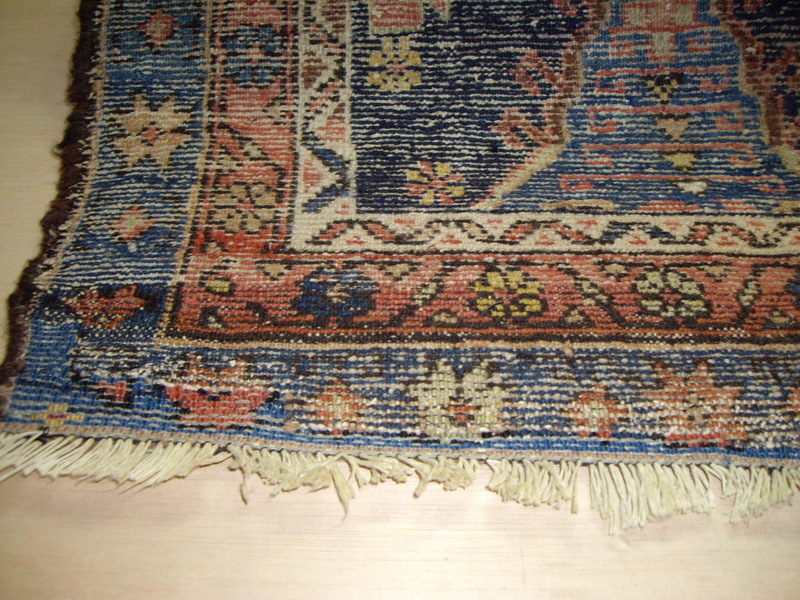 This large Indian carpet was ripped by a metal hook while in transit. 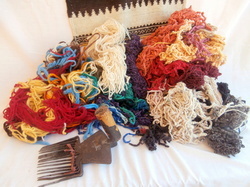 The pile and foundation warps and wefts were torn. 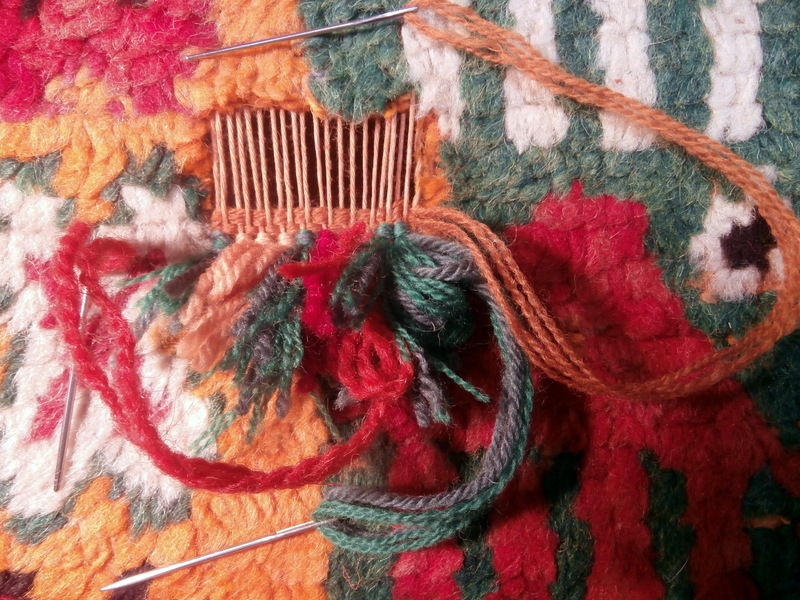 I am in the process of removing the damaged part and creating a rectangle ready for re-weaving. 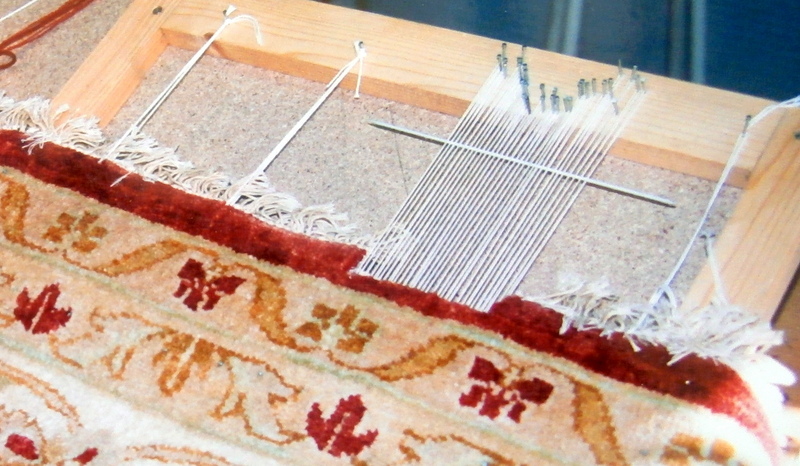 New warps inserted and the carpet is under tension on a frame. 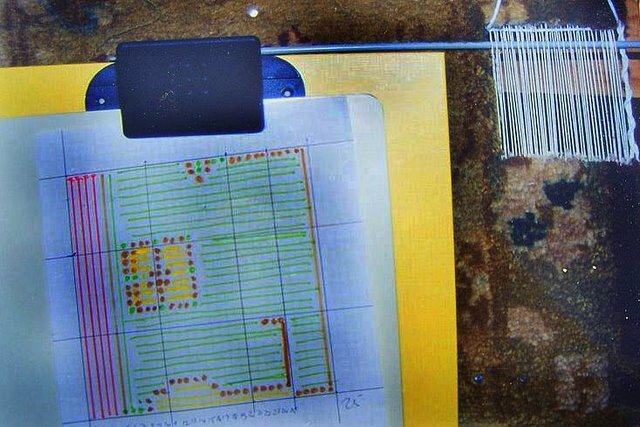 The design for re-knotting has been drawn on graph paper. Nearly finished. 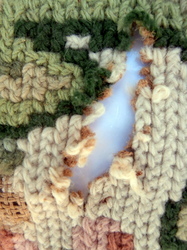 The area has been re-knotted with wool from the studio. All that remains is the final trim. Justified restoration. This magnificent antique Hamadan runner had one area of damage but was otherwise in excellent condition. The piece was pinned to a frame and several hundred warp threads inserted invisibly from the back. 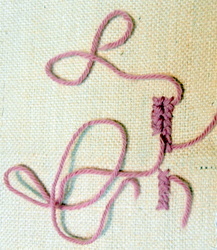 The damaged area was then re-knotted in colours to match the original. 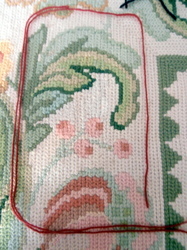 This shows the frame to which the area to be restored was tightly pinned. 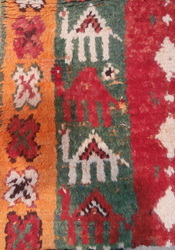 the wools were accurately matched and the existing Turkish knot copied. With a little help from my friend. The reconstructed area seen from the back. 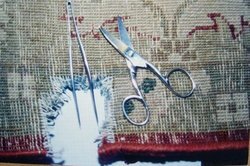 It is vital to match the warps, wefts and knots of the original. This old Heriz carpet was severely attacked by moth. 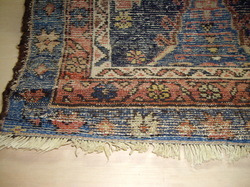 After being washed and sterilised the damaged areas, of which this is one, had the damaged pile removed. 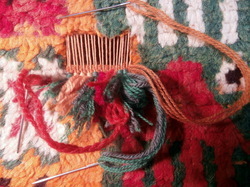 It was then re-knotted with the same colours and style of knot. This shows the restored area from the back. 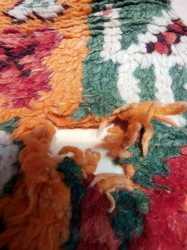 This is an old Turkish carpet from Konya which has one major hole and 10 smaller ones. 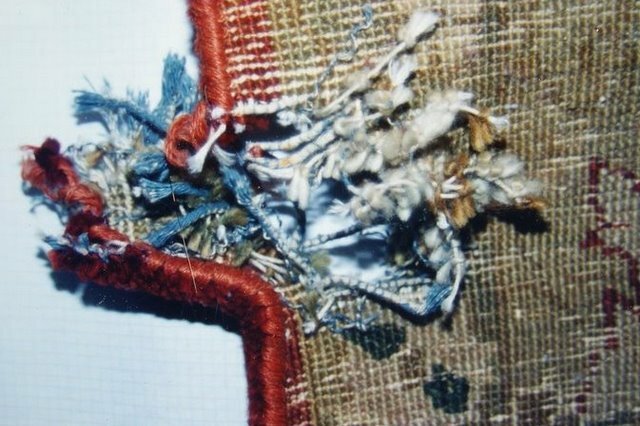 It has been washed to reveal the true colours and the large hole is now ready for cleaning out prior to reconstruction. 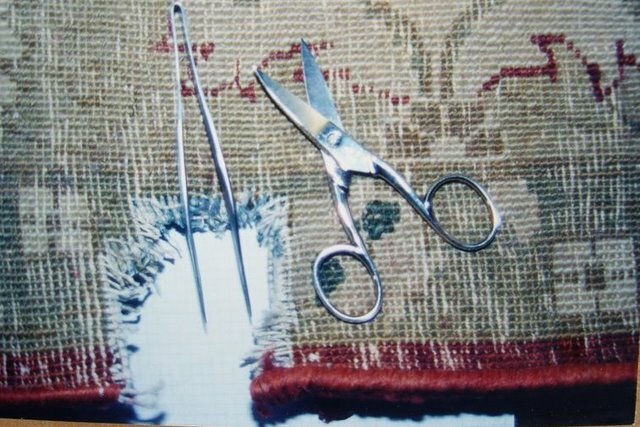 Most restorations are fairly small areas and the piece can be pinned to a frame to create the tension needed to accept the new warps, wefts and knots. 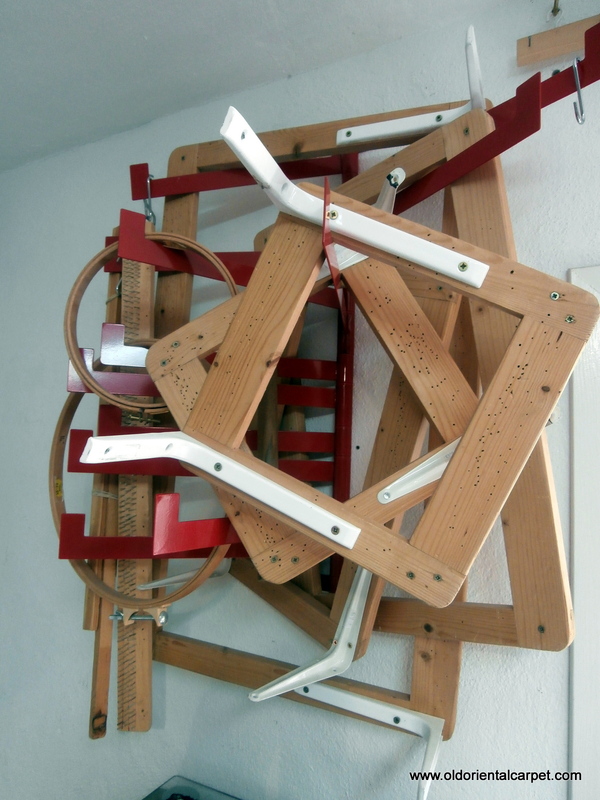 Frames for most occasions. 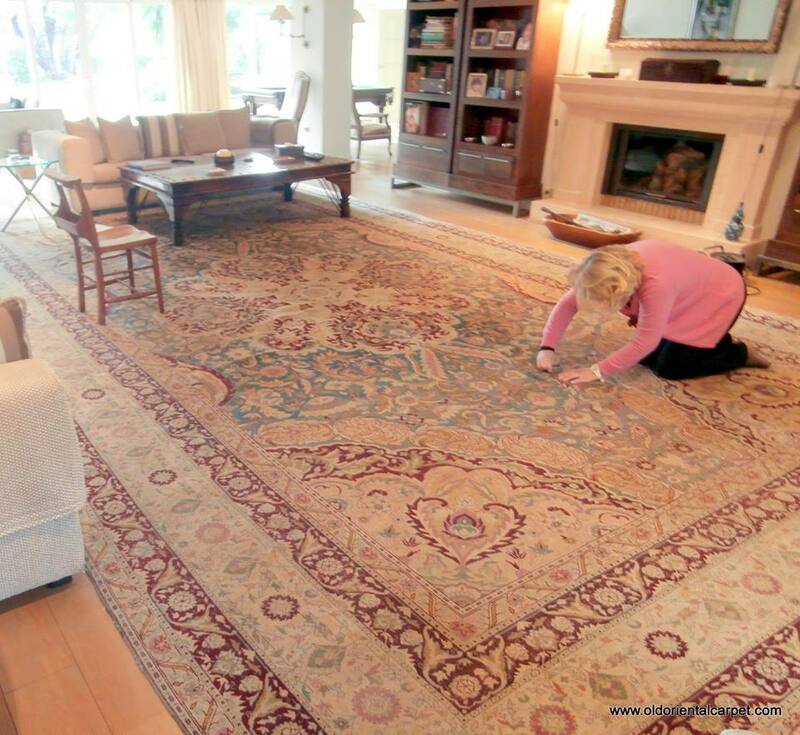 If a rug needs refringing it is neccesary to use a much wider one if possible to accomodate the whole width of the rug. 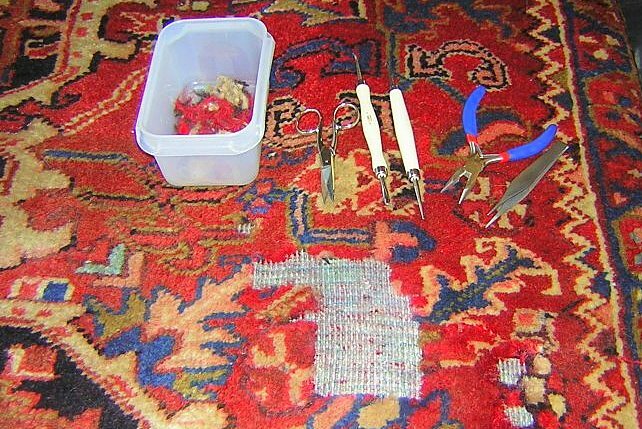 Matching the exact shades of wools to be used can take a long time. I ususally do this outside the studio in natural daylight. This was a real challenge. This chair was decorated with 10 strips of antique Portugese embroideries, all of which were worn beyond repair. 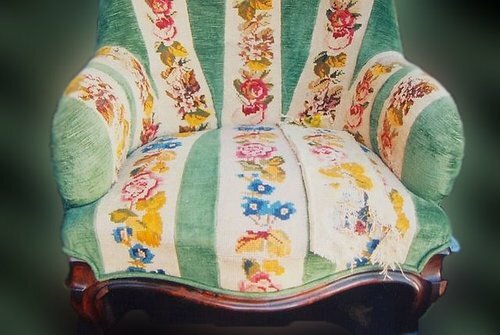 We made new embroideries to match and stitched them back on to the upholstery. The right hand one on the seat still awaits replacing. 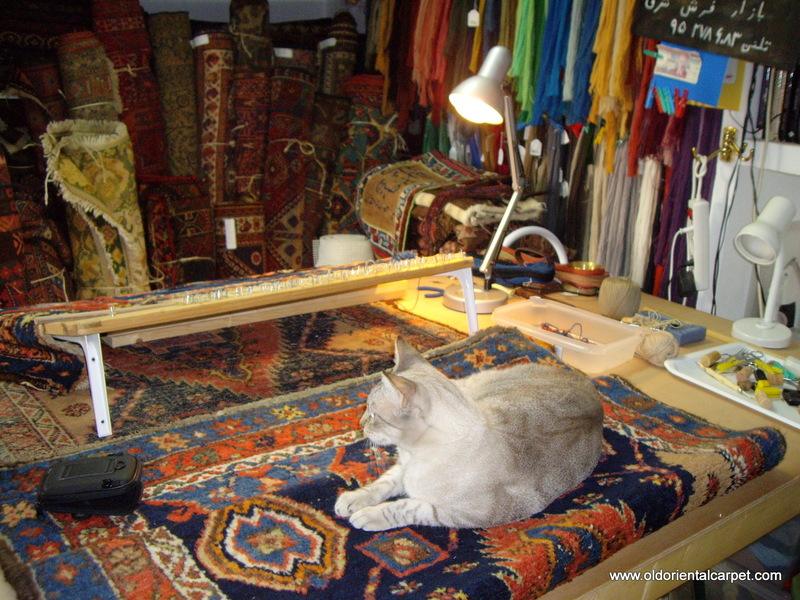 This is the 296 year old Royal Tapestry Workshop in Madrid. 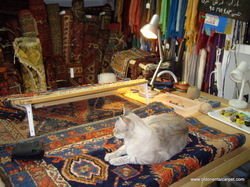 They were wonderful and allowed me a short internship when I arrived in Spain. 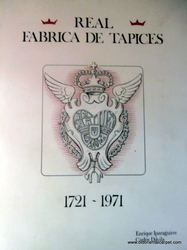 I saw original designs by artists such as Goya and Velaquez. I was made welcome by the then owner who was the 9th successive generation of the founding family. 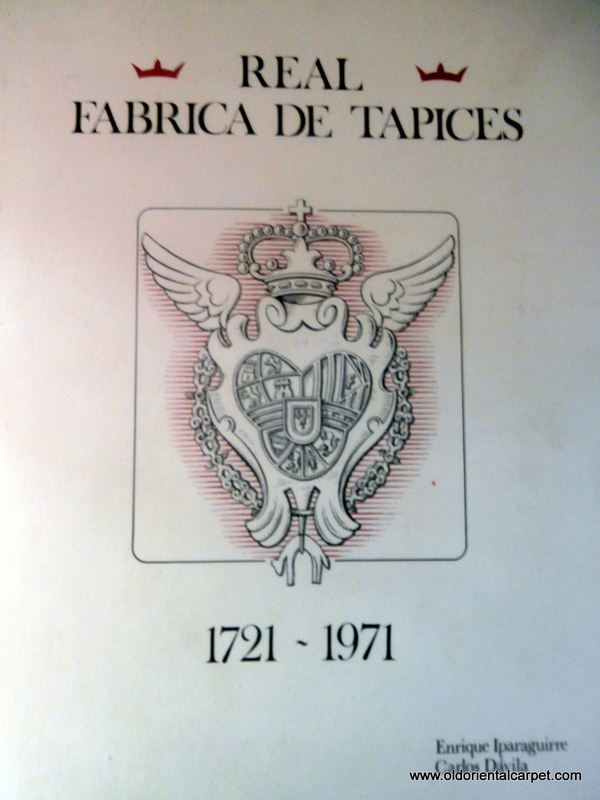 Book issued by the Royal Tapestry Factory to celebrate 250 years of continuous production. HIGH ATLAS BERBER WOOLS which I brought back in hand luggage on the last trip. 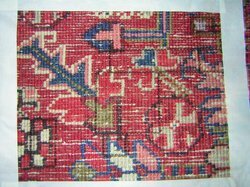 Often a reweave is very small and happens when a rug is caught on a nail or hook in the Berber tent or dwelling. 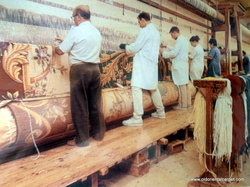 It is vital to use the same ply of wool and colour as the original when restoring. 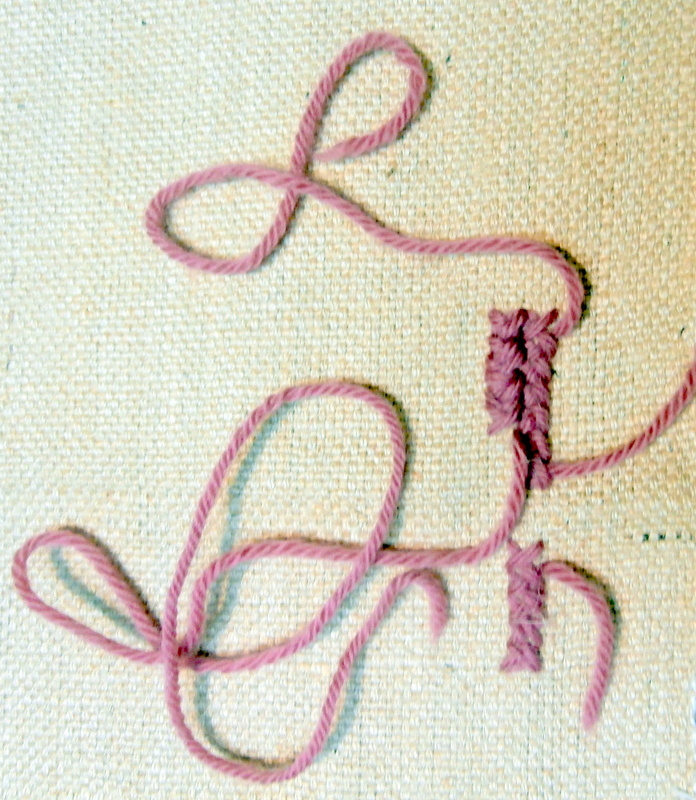 Practice stitching to get exact thickness and shape. The wound cleaned and new foundation threads being inserted while working from the back of the rug. 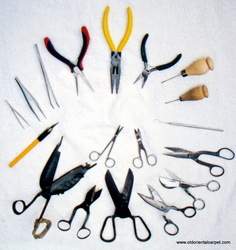 Fine tools, sharp needles and beeswax to treat the thread are important. 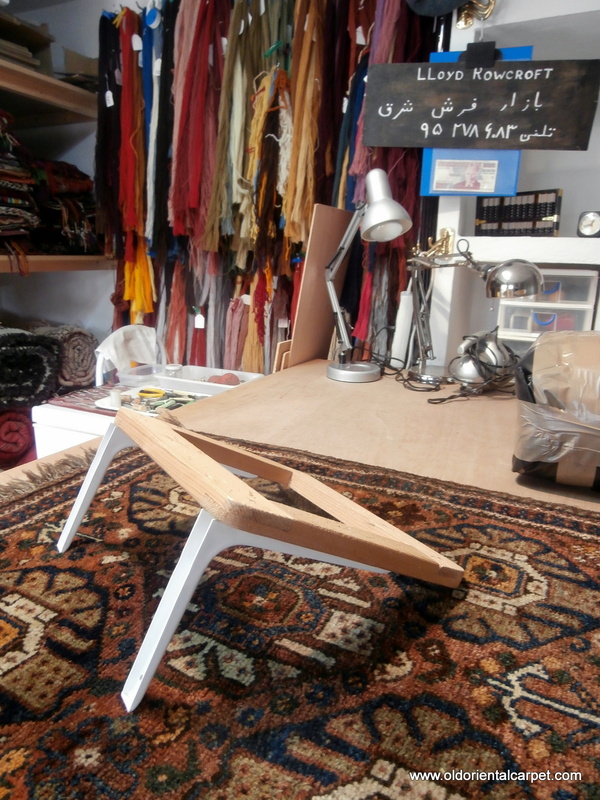 HEAD TRANSPLANT FOR CAMEL PERFORMED IN SPAIN. 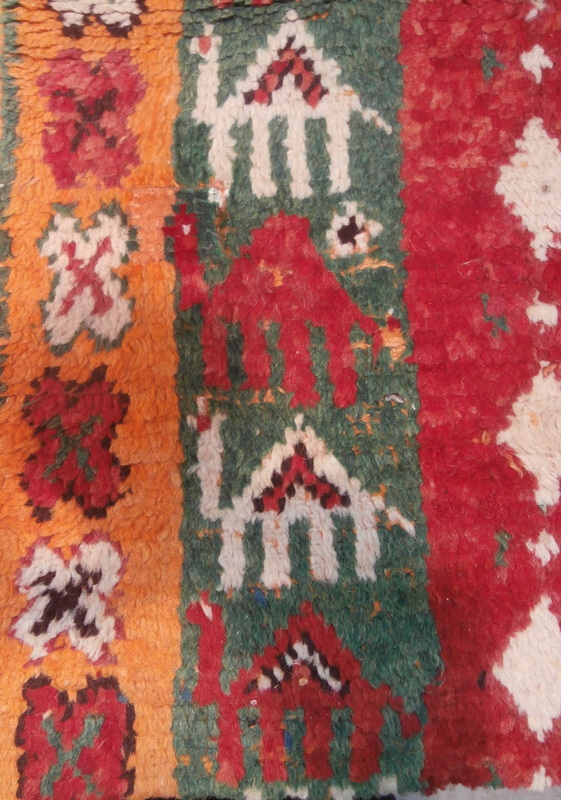 Humphrey the camel is from the Ait Douchen Berber tribe in the High Atlas in the region called "The Gateway to the Sahara" Unfortunately he lost his head and neck after being caught on a sharp wire fence. He was admitted to our clinic for skilled surgery and has recovered perfectly. Reconstruction finished and the rug is off to the recovery room for final brushing to arrange the pile so that it lies in the exact same direcection as the original. 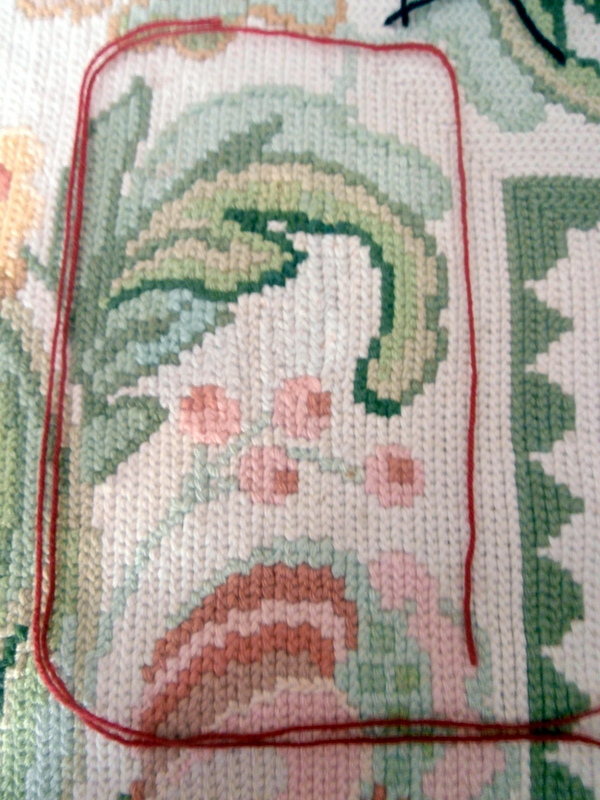 Indvidual hand tied knots copying the original design were tied, row by row. 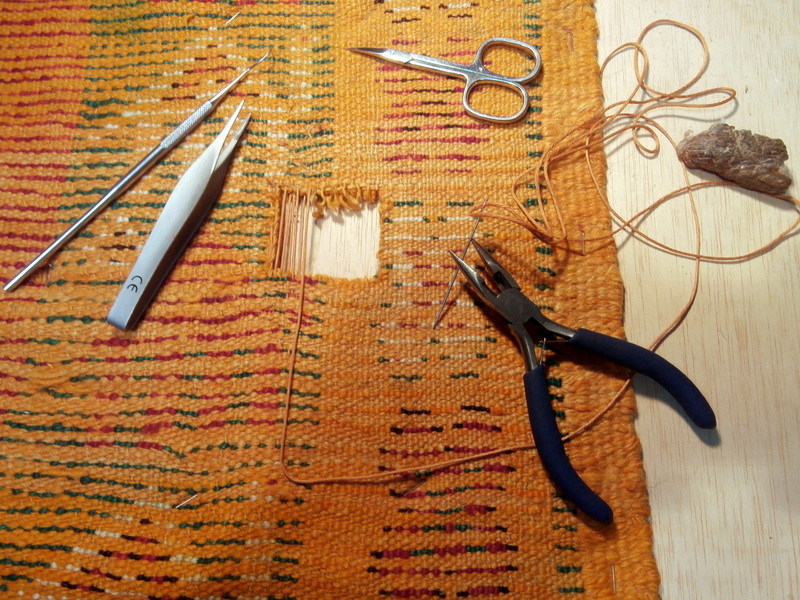 To achieve the same tension, which is vital, the area to be worked on is pinned tightly to a small weaving frame. All the shades of colours were blended from wools we have in our studio. WHERE DO YOU FIND YOUR WOOL? is a question often asked. The best source is usually in the same places as the rugs themselves are made. 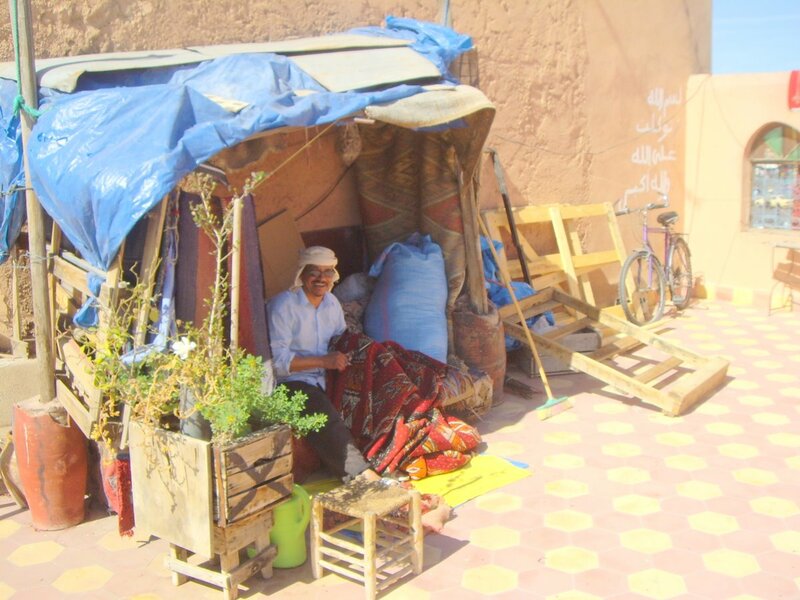 I buy from the Berber lady, wearing the traditional Berber rural wide brimmed hat for protection against the sun, in this town in the Middle Atlas. 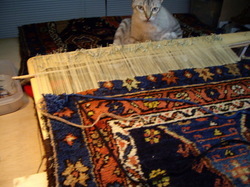 She often has wonderful old natural dyed shades stripped down from damaged flat weaves. 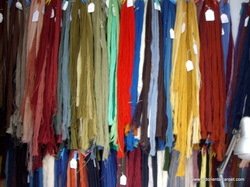 Incredible shades of colours hanging to dry in the bazaar in Marrakech. This dyer, as with many of his colleagues, specialises in a limited range of colours. 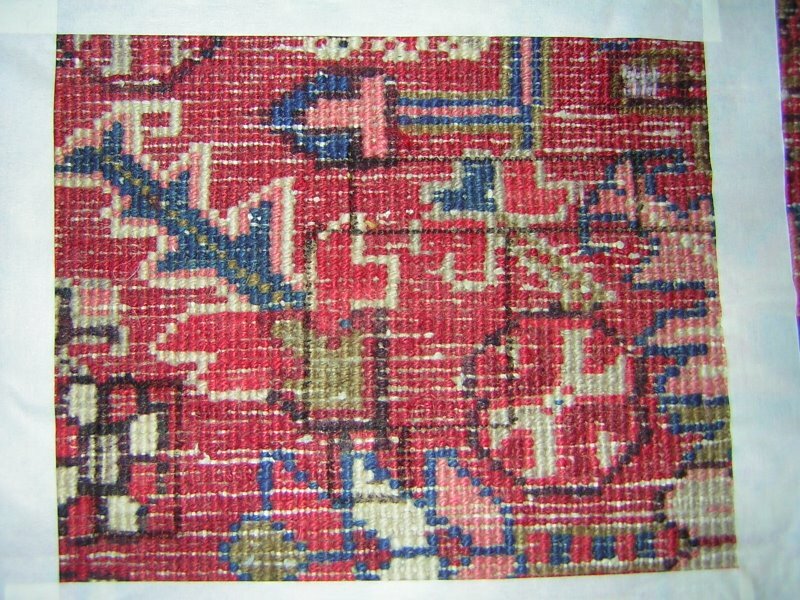 THIS ANTIQUE INDIAN CARPET was woven in the jail in the city of Agra in the late 1800s. It had a small tear in the centre but because it measured about 7 x 4 metres, or 23 x 13,5 feet, it was too heavy to move. 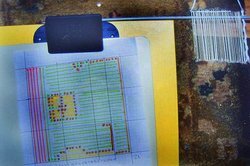 We placed a sheet of plywood under the damaged area to give us a firm base to work on and carried out the reweave from the front. We had sore knees for several days. 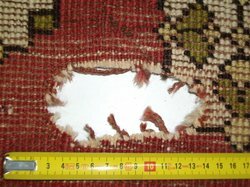 EVEN BRAND NEW CARPETS CAN BE DAMAGED, in this case the outer border of a new Indian piece was accidentaly burned and the pile and foundation destoyed. 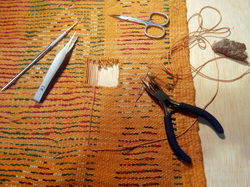 Here I inserted new warp threads under tension from the back and the piece is ready for re-piling with individual knots.